Pine straw popularity is fairly recent in Texas, but it has been a popular landscape round cover throughout the South for the last 25 years. In fact, it is one of the most widely used mulches for all size projects ranging from residential flower beds to industrial complexes and highway landscapes. 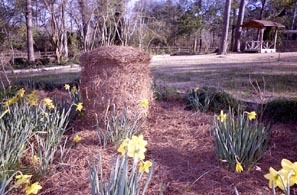 Landscapers, building contractors, and homeowners have discovered that pine straw has superior properties over other mulches. Unlike other dry organic mulches such as pine bark, leaves, grass clippings, and peat moss, pine straw helps provide favorable growing conditions and stimulates healthy plant development. We now have 5 balers in East Texas. They are producing over 160,000 bales per year. To support these balers and the industry the US Forest Service has given a grant to the RC&D. 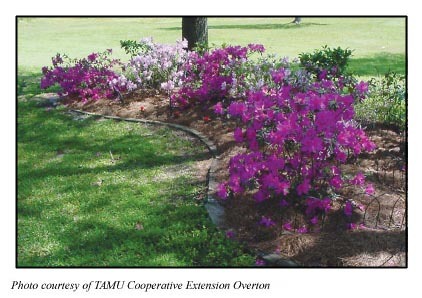 These funds are being used to support Dr. Eric Taylor of Texas A&M Cooperative Extension in Overton. 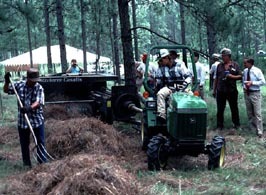 This is an in-depth site developed by Dr. Taylor that links to pine straw harvesters and other professionals, has streaming video clips of management practices, shows application and use of pine straw, and economic support system, box baler plans, calendar of related educational opportunities, a glossary of related forestry terms, and much more. 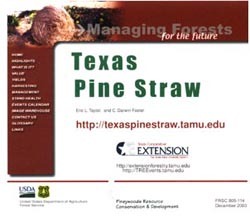 This is an eye-catching brochure for distribution in home improvement superstores, that informs homeowners and landscapers on the application, use, advantages, and availability of Texas pine straw. 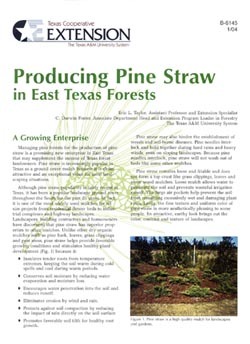 This is a ten-page publication directed towards non-industrial forest landowners and harvesters, describes the site requirements, management practices, and economic attributes of pine straw harvesting. This video collection is made available on CD-ROM packed with more than 600 megabytes of pine straw video clips, activities and text.